The FALCON project comes to an end by end of this year. During the Final Review, all project outcomes are presented and demonstrated, including among others the FALCON VOP, Business Case demonstrators, Technical achievements (e.g. developed software prototypes) as well as exploitation, dissemination and standardisation results. The technical meeting held in Bremen at BIBA’s premises aimed to finalise and perform final configuration of FALCON VOP. Moreover, applicability of available test scenarios was checked. The next step is to arrange with end-users a webinar to introduce the final version of the VOP for their evaluation. 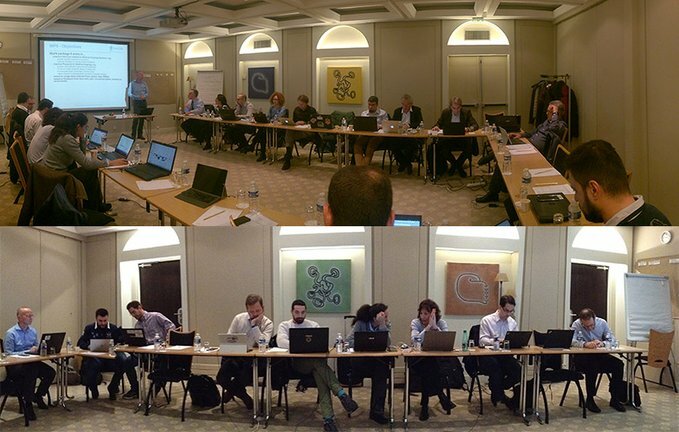 The GA meeting in Bilbao was hosted by FALCON end-user partner, Datapixel. The aim of the meeting was to perform proof of concept of FALCON VOP and to define a roadmap and check the progress of the implementation of FALCON demonstrator. Further alignment of FALCON exploitation strategy and dissemination activities were discussed. 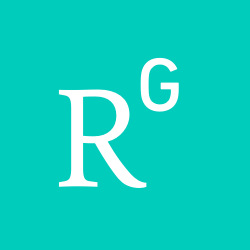 Moreover, Further exchange with other projects or groups (e.g. PSS Cluster Group), especially related to FALCON Standardisation activities were promoted. After a fruitful meeting in Paris, FALCON partners have continued their work on integration of WP1-4 existing modules in the FALCON VOP and held an online coordination meeting for 3 days from 14th to 16th of December 2016. The aim of the meeting was to identify the interdependencies among each FALCON module and to implement all necessary interfaces in order to achieve a running FALCON VOP at the end of December 2016 (Project Month 24). The General Assembly meeting in Paris, organised by FALCON French partners ISADEUS and MEWS, took place from 15th to 17th November 2016. So far, FALCON has reached its second milestone, namely the FALCON integrated architecture based on requirements from 4 business scenarios. Besides presenting current activities of each WP, other main topics of discussion in the meeting were among others FALCON modules integration and implementation strategy, as well progress on standardisation and exploitation plan. A roadmap for the modules integration and implementation was developed and will be implemented within the rest 12 months of the project lifetime. The meeting was attended by all partners and two members of FALCON Advisory Board, Mrs. Begoña Laibarra and Mr. Jean François Balducchi. TU Delft and Philips has arranged a meeting in Best to discuss further on which use cases to be considered for forecasting based on PUI. FALCON mid-term review was attended by project partners and EU Project Officer, Mr. Arnaud Petein. The partners presented the first result of the business story definition for research and exploitation of FALCON platform, research and technical results so far, as well as plan and activities on exploitation, innovation, standardisation and dissemination. FALCON project has been progressing according to the targeted plan. Positive feedbacks and recommendations were received from the PO at the end of the meeting. All consortium members met at Philips’ facility in Best for the biannual FALCON project meeting. 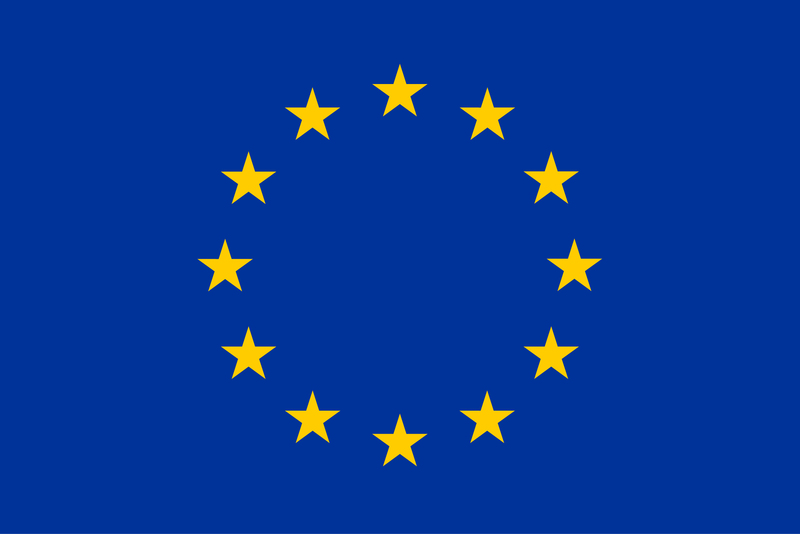 The main highlight of the meeting is to discuss the development of business stories, including exploitation and Standardisation strategy, as well as preparation for the review meeting with the EU, which will take place in upcoming July 2016. More detailed discussion on Philips product features and feedback from embedded systems / field call logs of Philips was the main goal of the WP 6 meeting between TU Delft and Philips, which took place in Delft. FALCON technical partners met discussing the FALCON platform implementation infrastructure and strategy, including topics on use of triple store, agile software engineering approach , UI Mock-ups, data streams, update of FALCON VOP architecture, data analytics and visualisation service, functionality identification, etc. After the FALCON General Assembly Meeting a joint meeting between the Manutelligence project and the FALCON project has been carried out. From the FALCON project BIBA, EPFL, Holonix, Vinci (now MEWS Partners) and Isadeus joint the meeting, while from Manutelligence side Dassault Systemes, POLIMI and D´Appolonia joint. After the introduction of the projects by Karl Hribernik (BIBA, FALCON) and Sergio Terzi (POLIMI, Manutelligence) the main focus relied on discovering synergies between both projects. Accordingly, the different lifecycle modelling approaches has been introduced by Ana Milicic (EPFL, FALCON) and Stefan Wellsandt (BIBA, Manutelligence) has been introduced. Furthermore, joint standardization activities related to the OpenGroup standards O-MI, O-DF and additionally the envisaged standard O-LM will be also focussed in the IoT-Workgroup of the OpenGroup. Finally, Innovative Exploitable Assets has been discussed in a session leaded by Jean-Sébastien Gros (VINCI/MEWS Partners, FALCON). The GA Meeting in Bremen was hosted by BIBA. After a status update from all work packages several technical discussion and workshops has been carried. Besides topics dedicated to the implementation work within FALCON also the partners elaborated further on the Innovative Exploitable Assets of FALCON in workshops led by Vinci (now MEWS Partners) and Isadeus. During the second day, the current status and future plans have been introduced to the external reviewer of the European Commission Marcus Bjelkemyr and to our Advisory Board Member Begoña Laibarra. A joint meeting of WP 3 and WP 6 between EPFL, Philips, TU Delft, Holonix and BIBA with focus on further definition of healthcare products business scenario was held in conjunction with WP 4 meeting in Delft. - LCA – Lifecycle Cost Analysis. 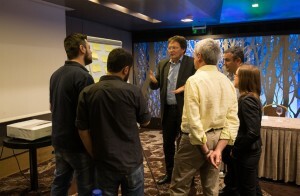 The fourth WP6 meeting between TU Delft and Philips was held in Best. The main focus of the meeting was to further define macro- and micro-workflow of healthcare products business scenario. 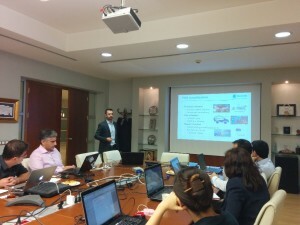 The first official physical WP5 meeting was held in Istanbul. Our partner Arçelik hosted the workshop , which focused on the definition of Business Scenario for White and Brown Goods related to the key objectives of the project. In addition to our hosts from Arçelik a delegation of project partners from BIBA, EPFL and Holonix also took part in the workshop. During the meeting the Product Service Systems related to White Goods (for example, washing machines) and Brown Goods (for example, smart TV’s) were defined. The first WP 9 meeting, participated by MEWS and ISADEUS, focused on definition and development of FALCON Innovative Exploitable Assets and Impact – Knowledge Briefs (K-Briefs). -	Analysis of the IDEF0 and IDEF1 flow prepared by HOLONIX over DENA processes description. -	Review of the AS-IS and TO-BE processes description through the creation of the IDEF graphics second version. The third WP 6 meeting between TU Delft and Philips was held in Delft. The main focus of the meeting was to conceptualise and define further the healthcare products business scenario. The first General Assembly Meeting of the FALCON project was organized and hosted by our partner UBITECH in Athens. Besides technical discussions, the main focus of the meeting was on developing relevant Business Scenarios for FALCON. The current Business Scenario definitions of the Business Scenarios were presented and elaborated. Additionally, several workshops with regards to dissemination, exploitation and standardization of future project outcomes were carried out by our partners Vinci (now MEWS Partners) and Isadeus. The second WP6 Meeting was, again, hosted by Philips and joined by TU Delft. The objectives of this meeting were further discussions as well as the development of macro- and micro-workflow Business Scenario definitions. The first WP3/WP8 Meeting was led by Datapixel and attended by EPFL. The main objectives were the presentation of the Business Scenario description and a technical discussion in order to explain and improve the definition of the WP8 Business Scenario. The first WP7 Meeting was organized by Holonix in Meda, Italy. DENA as well as i-Deal joined the host partner in this meeting. The main goals were to share knowledge about the functional project objectives and to write a first draft of the requirement definitions for the Clothing Textiles Business Scenarios. 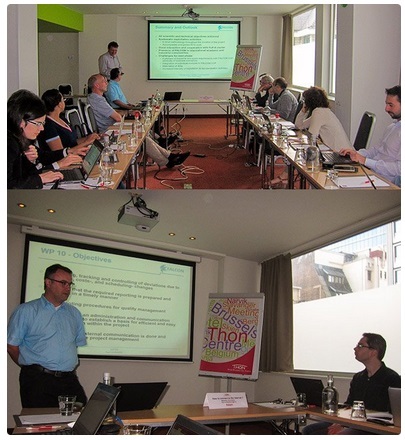 The first WP6 Meeting took place in Best, Netherlands. TU Delft and PHILIPS (hosting partner) participated in this meeting dealing with the transfer of knowledge about medical imaging. Another key topic was the discussion and initial composition of macro-workflow Business Scenario definitions. The FALCON project has officially started in Brussels attended by a representation from the European Commission, Mr. Arnaud Petein. After a warm welcome by Arnaud Petein and the Coordinator Prof. Dr.-Ing. Klaus-Dieter Thoben, the project vision was presented by the Technical Coordinator Karl Hribernik. Moreover, all work package leaders presented their plans and provided a more detailed overview of what lies ahead for the next 36 months. This project has received funding from the European Union’s Horizon 2020 research and innovation programme under grant agreement No 636868.